1. Heat oil to 350 degrees F. Roll lobster in flour. Add chopped truffles to tempura batter. Dip lobster into batter and place in oil. Fry for 4 to 5 minutes. Remove from oil and drain on paper towels. Reserve. 2. Mix mango, onion, bell pepper, lemon juice and cilantro together in a bowl and reserve, refrigerated. 3. In a small bowl, toss the fried lobster in the miso dressing. 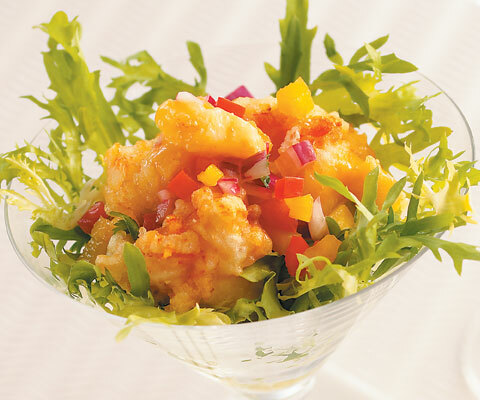 Place frisée in a martini glass; add lobster and top with mango relish. Paddle to Squaxin 2012 | Teachings of Our Ancestors. oysters and salmon, have always been highly respected by our people. We had an Amazing time and experience helping our Friends at Canoe Journey 2012.
nine days of Breakfast and Dinner. 3,000 to 10,000 people per day.